Daniel Boone was, of course, the famous frontiersman. Capt. Isaac Van Bibber was killed 10 Oct 1774 in the Battle of Point Pleasant, Dunsmore's War, often considered the true opening battle of the Revolutionary War. His brother, Pvt. Peter Van Bibber, was wounded in that same battle. Col. Henry Clark served with his brother, Riderus Clark, in the Cherokee Expedition in North Carolina, 1759-60, and he served in the Revolutionary War at the Battles of Holston Island, Chickamaugua, Hiwassee, and others. His eldest son, Lt. Benjamin Clark, served under him though Benjamin was barely old enough to enlist. Given their ages, I presume Maj. Isaac Van Bibber, Jr., and Capt. John C. Clark served in the War of 1812, but I need to check these out. 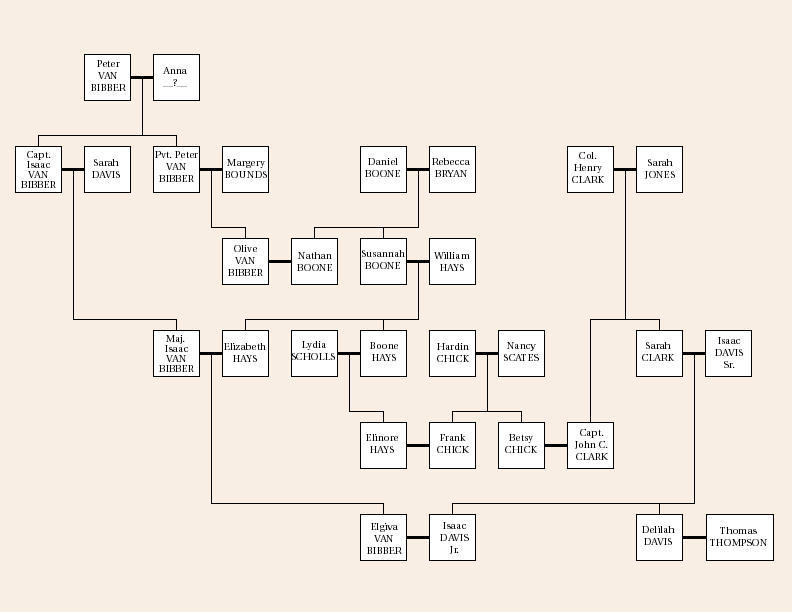 Based on this chart, and as far as we know, Delilah Davis is not blood kin to Daniel Boone, though the children of her son, Isaac Davis, Jr., are his direct descendants. The parents of Sarah Davis, wife of Capt. Isaac Van Bibber, Sr., are not known. I have spent a little time trying to determine whether she could be related to Isaac Davis, Sr., son of James Davis & Hannah Ramsey. I haven't gotten very far though the geography and timing are not incompatible. Two of the daughters of William and Susannah (Boone) Hays married Davis'es — in Missouri. These Davises originated in Pennsylvania, not Virginia, so do not appear to be related to the Davises in the chart, above.